From 01.01.2017, Kazakhstan is visa free for Danish citizens traveling for tourist and business purposes under 30 days period of stay in the country. If you are staying for more than 30 days, you are required to apply for a visa. An introduction/cover letter from you, where you explain the purpose of your travel,your contact information, entry and departure date, as well as the name of cites you want to visit in Kazakhstan. Confirmation of your hotel reservation. Send all the documents to Alt Rejser together with a følgebrev, or personaly sumbit it in our office. Note: If your case is urgent, we recommend that you send the documents to us, as a “Quick Letter” or as a registered letter. In this case the post must be handed over to the post office and we must be able to receive it the following day. If you send it as a normal post, it will take up to 7 days (or more) before we will recieve the documents. An introudction/cover letter from you or from your employer that shortly explaines your puropse of travel, contact information, entry and departure dates, as well as the name of cities that you will visit in Kazakhstan. 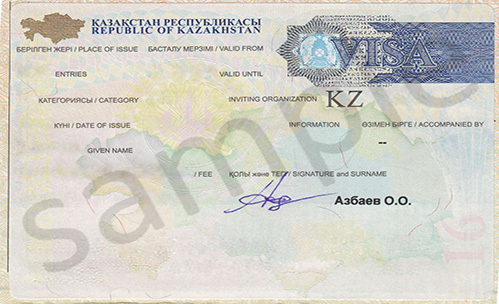 It is only possible to obtain a mulitple visa for 1 year, if you have a business invitation arrange through Kazakhstan immigration authorities. We at Alt Rejser can help you with that and it wil take us 3 weeks to process. Completely fill in the order form for invitation and we will contact you as soon as possible. Send all the documents to us together with a følgebrev, or personally submit it in our office. Note: If your case is urgent, we recommend that you send the documents to us, as a “Quick Letter” or as a registered letter. In this case the post must be handed over to the post office and we must be able to receive it the following day. If you send it as a normal post, it will take up to 7 days (or more) before we can recieve your case. Prices include all embassy fees and are applicable to Danish nationals only. All prices include Danish tax (moms). We will send your passport together with the corresponding visa, as soon as your visa is ready.